The results will change earnings season, and perhaps broad market performance going forward. There comes for almost everyone, a moment. That moment where you know that nothing will again be the same. For some that moment is the day they set off for college. For others, that moment might be the first day after taking a new job, or a big promotion. For me, that moment included some orderly yellow footprints painted on the pavement on an island off of South Carolina, and an angry fellow who seemed to be in charge. Markets face such a moment tonight. Yes, I know. October was ugly. Tuesday, and Wednesday... not so much, though there ware large sell programs thrust upon the marketplace late on Wednesday that took the luster off the the day's performance. All of that might not count all that much in a few hours. The moment I speak of that will change earnings season, and perhaps broad market performance going forward would be the release of Apple (AAPL - Get Report) fourth quarter earnings results. Helmets and flak jackets, gang. 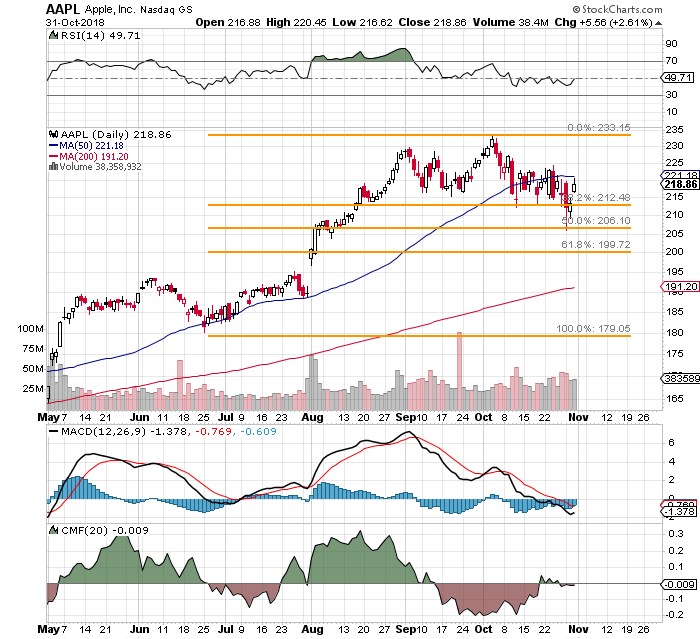 Jeffrey Marks, Senior Portfolio Analyst, Action Alerts PLUS, said that "Unlike its FAANG peers, Apple's shares were certainly resilient to October's selloff. This could be a signal that the market has embraced the thesis that it should be valued like a consumer-packaged good stock (hardware) with a fast-growing software business (Services), a viewpoint that could lead to higher valuations in its future if it can exceed expectations tonight." There has been talk that the new series of iPhones have been selling at a less than optimal pace. We hear rumblings like this every quarter, and then the firm usually beats. Consensus view is for earnings growth of 34%, and revenue growth of 17%. Lofty expectations. I almost wish that the stock had behaved less bullishly this week, so that the firm would only have to "meet" this high bar, instead of having to crush it, which is likely where we are now. The good news is that supplier Qorvo (QRVO - Get Report) crushed their quarter on Wednesday night.That stock traded up as we (well.. you) slept, but that firm guided toward a tougher current quarter on reduced expectations for demand from China. As far as hardware sales go, Apple could theoretically be in a similar position. However, Apple is less reliant on those hardware sales than the firm used to be. Revenue derived from recurrent revenue streams will be in focus tonight. Think iCloud. Think Apple Pay. Think Apple Music. Guidance here may take precedence over broader corporate guidance. Still, I am more cautious going into this moment than I was but a few days ago. Those of you who read me on a regular basis, already know that I have a 255 price target on AAPL, and have recently cut my panic point from 206 to an even 200. I come in long this stock, and short November 16th $200 put options, as well as a number of deeply out of the money puts that would require a plague or a world war to come into play. So, let's not even go there. What I would like to do is lower net basis further, but not through a (put) sale that further increases my equity exposure should there be a severe selloff in response to the digits. That leaves the sale of what are known as covered calls as a way to get this done. The catch is that this move will cap my profit in the event of a Tim Cook victory parade through the streets of Cupertino, California. This is really a matter of how much the trader is willing to sacrifice in potential profit in order to reduce net basis ahead of the release. This is known as a "bull call spread". This trader is risking a net debit of $3.94 to try to bring in $10 worth of revenue for a potential profit of $6.06. At the time of publication, Stephen Guilfoyle was Long AAPL equity, Short AAPL put options.